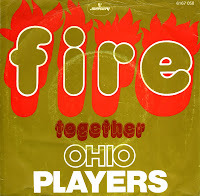 'Fire' was released from the Ohio Players' album of the same name, both released in 1975. The single peaked at number one on the US Billboard Hot 100 and number 9 in the Dutch Top 40. The song was recorded at Mercury Record's Chicago-based studio. While performing it in California, the band let Stevie Wonder hear the basic track for the song and he predicted that it would become a big hit. I bought this single as a gamble. Later on I found out that I was acually looking for the 1968 hit 'Fire' by the Crazy world of Arthur Brown.